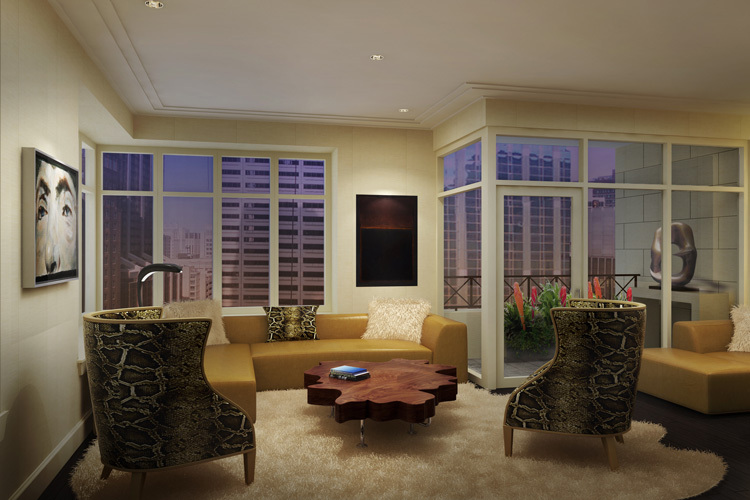 Discriminating homeowners privileged to live anywhere in the world they choose will soon begin moving into the ultra luxurious Ritz-Carlton Residences, Chicago, Magnificent Mile. At the tony intersection of Michigan Avenue and Erie Street, it is the newest luxury condominium tower tucking into the city’s iconic skyline. It is managed and staffed for full service by The Ritz-Carlton Hotel Company, LLC. A glamorous foyer hints of the luxury, style and panache throughout this gracious residence. 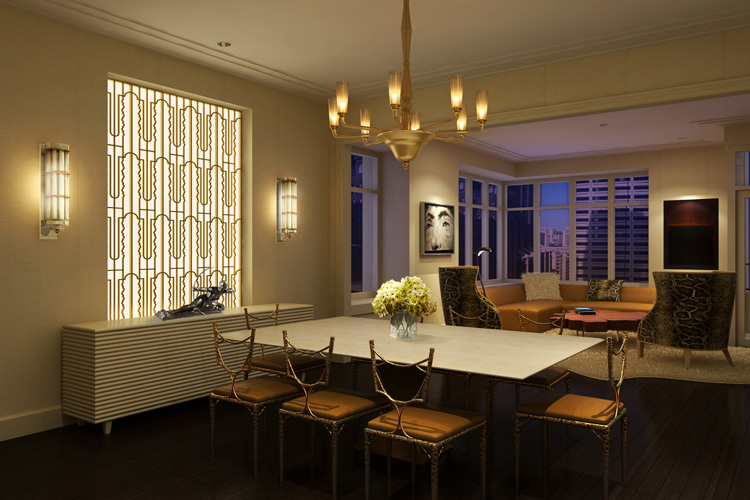 A pair of Art Deco style chandeliers bathe the gilded ceiling in soft shadows and reflections. The invitingly sensuous curves of the custom marble and limestone floor were inspired by a setting in Rome’s Grand Hotel Ritz. The frosted glass backlit screen establishes formality in the dining room where handcrafted limited edition chairs (signed by the artist) surround a bone table. They are typical of the thoughtful collection of exquisite furniture and artwork showcased throughout this home. Chairs upholstered in python, a coffee table sliced from a tree and the organic, free-flowing rug nod to nature, representing the stars of this season’s high fashion collections. 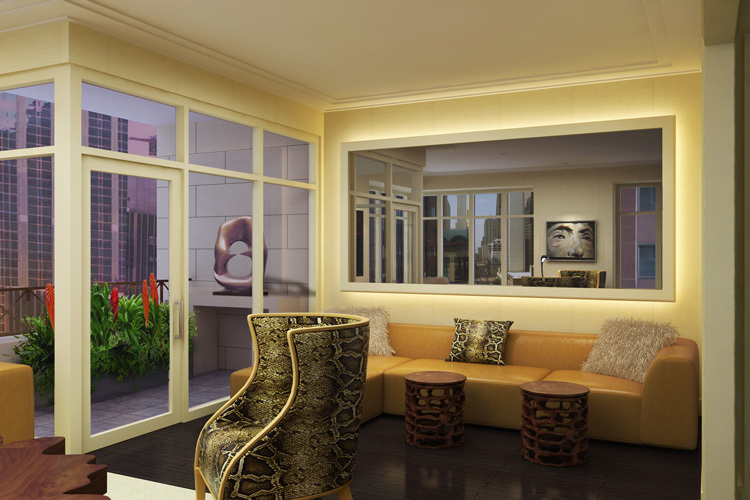 A customized lighting plan dramatizes art both within the space and on the adjacent terrace. A backlit mirror reflects a collage of Chicago’s World-class architecture while the terrace overlooking the Magnificent Mile is an urban sculpture garden. Inside more functional art — Mario dal Fabbro’s Midcentury Modern carved tables — echo the pattern of the snake skin upholstery. 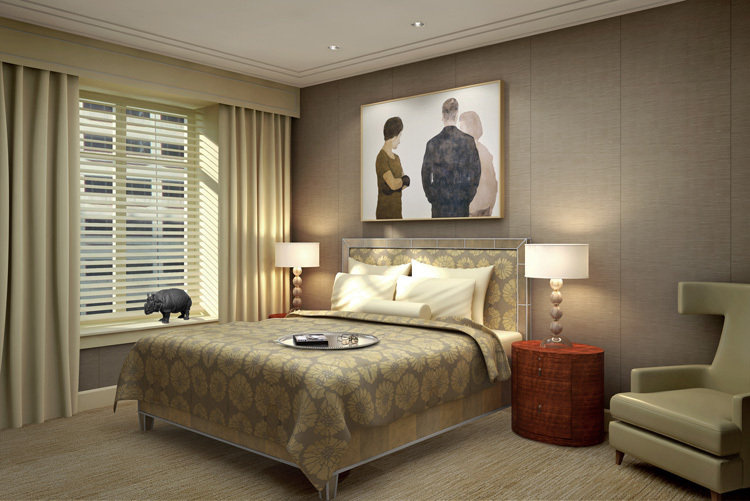 We created this master bedroom to provide ultimate relaxation. Yards of cashmere fabric (draping the window and wall behind the upholstered bed), heavily textured wool carpet and linen wallcovering enhance this luxurious setting. The sculptural lines of the ivory leather chair elevate it to a work of art. Paying homage to the culture, uber chic fashion sensibility and rarified style of the Michigan Avenue-Oak Street corridor was our goal for establishing this home’s dramatic sophistication. As always, we at John Robert Wiltgen Design, Inc. welcome a challenge that combines creativity with function and style.